Most of Australia’s estimated 500,000 species are invertebrates, and half are insects. Invertebrates are the ecological glue that holds ecosystems together; they are a food source for many vertebrates, and provide ecological services such as nutrient recycling, pest control and pollination. Despite these critically important functions, invertebrates are rarely the iconic or charismatic animals that garner human attention, although some play an important role in Indigenous beliefs (see Box BIO11). In addition, several species transmit diseases to humans and animals. Unlike plants and mammals that are relatively well known, only about 25–30 per cent of Australia’s insects have been formally catalogued and named by scientists. Many invertebrate species are small, have restricted distributions, have precise ecological requirements, and are difficult to identify without specialist knowledge and techniques. However, because of these attributes, many species are sensitive to very subtle environmental changes. The main pressures on Australia’s invertebrate biodiversity—habitat reduction and fragmentation, altered fire regimes, invasive species, and climate change—are increasing. There have been few direct measures of the status of Australia’s invertebrate biodiversity. Indirect evidence from estimates of forest cover, and the distributions of rare and threatened vertebrates and plants suggests that invertebrate populations continue to be at increased extinction risk, especially along the east coast of Australia and in the south-west of Western Australia. 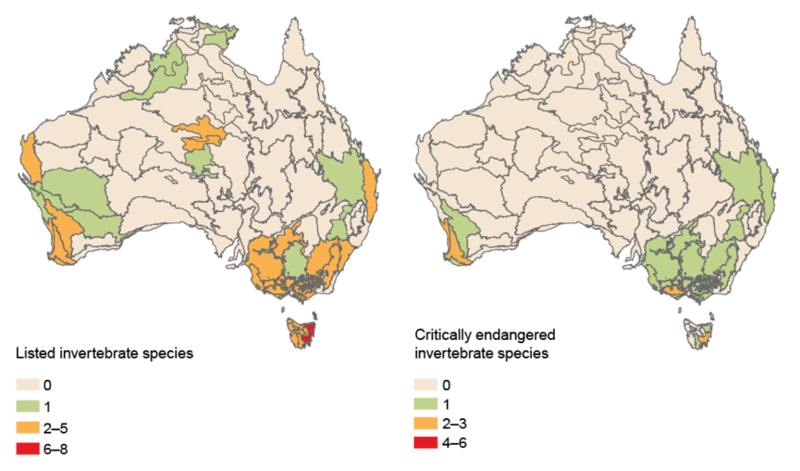 The IBRA regions containing the highest number of EPBC Act–listed invertebrates are in eastern Tasmania (Figure BIO23) and on Australian islands that cannot be seen in this figure. The Pacific Subtropical Islands IBRA region, including Lord Howe Island and Norfolk Island, contains 8 listed invertebrates, including 6 that are critically endangered. Flinders Island to the north-east of Tasmania also contains 8 listed species, including 5 that are endangered. Seven of the 8 listed fauna on Norfolk Island (1 species) and Lord Howe Island (6 species) are land snails; the remaining species is Lord Howe Island phasmid (Dryococelus australis). Lord Howe Island fauna have suffered significantly from the introduction of exotic animals and human disturbance. Listed species from eastern Tasmania and Flinders Island include insects (e.g. Tasmanian chaostola skipper—Antipodia chaostola leucophaea; endangered), crayfish (e.g. Furneax burrowing crayfish—Engaeus martigener; endangered), beetles (e.g. broad-toothed stag beetle—Lissotes latidens; endangered) and other invertebrates (e.g. blind velvet worm—Tasmanipatus anophthalmus; endangered). Certain caterpillars have cultural relationships with Indigenous Australians that highlight complex links between ecology and human ecology. These caterpillars are imbued with meanings, values and uses for Aboriginal people that are very different from how western science views these species. Collaboration between Aboriginal knowledge holders and western scientists can provide land management information and the motivation needed to improve habitats that support valuable species. Alice Springs, known as Mparntwe to Aboriginal and local people, has many sacred sites. Arrernte people believe these sites to be associated with ancestral beings who metamorphose as animals and plants, which can also be totems for individual people. Ancestral beings, including 4 different types of caterpillars and 1 beetle, created parts of the MacDonnell Ranges, and certain gaps, rock piles, trees and woodlands in the Alice Springs region. The caterpillar ancestors travelled from various directions through the region. For Arrernte people, the imposing ridgeline of the eastern MacDonnell Ranges is also the ayepe-arenye caterpillar, and the ntyalke formed parts of the western MacDonnell Ranges. One dramatic gap (ntaripe/Heavitree), through which rivers periodically flow and people travel, is believed by Arrernte people to be formed where the ilperenye beetle savaged the ayepe-arenye and chewed off their heads. These caterpillar characters correspond to 4 scientific taxa of hawk moth: ayepe-arenye is the white-lined hawk moth (Hyles livornicoides); ntyalke is the vine hawk moth (Hippotion celerio); utnerrengatye is the moth Coenotes eremophilae; and the fourth irkngeltye is possibly the convolvulus hawk moth (Agrius convolvuli). Arrernte names and knowledge associate each caterpillar with a particular plant taxon: tarvine (Boerhavia diffusa and B. schomburgkiana), emu bush (Eremophila longifolia) and pink rockwort (Sedopsis filsonii). The plants provide forage and habitat for each caterpillar. The Arrente significance and complex linkages are exemplified in the word ayepe, which is synonymous with the plant B. diffusa, the umbilical cord of a newborn baby, and a practice that cares for the baby’s wellbeing. The ayepe (tarvine) plant is habitat to ayepe-arenye, the caterpillar. Nowadays, they are not eaten, perhaps partly because of their sacredness and increasing scarcity. Custodians worry about declines in these iconic species. For example, irkngeltye is rarely seen, and ayepe-arenye, once common, persists in pockets. These declines can be slowed with the reintroduction of Arrernte landcare practices, weed removal and sacred site protection. Arrernte beliefs and knowledge provide insight into the ecological processes that can be observed, and link culture to land management for future generations of Aboriginal people and other Australians. A set of photos showing the different caterpillars and their habitat. Source: Fiona Walsh, CSIRO. Study sources included bush-based observations; senior Arrente knowledge holders Rosie Furber (dec.), Wenton Rubuntja (dec.), Veronica Perrurle Dobson and Doris Stuart; and Alice Springs ecologists Mike Gillam and David Albrecht. Martu people also provided information about species used as food. Max Moulds provided photo-based identification for the caterpillar species.